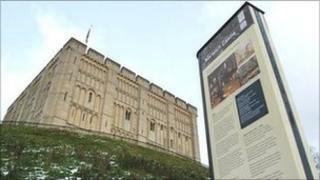 The Royal Norfolk Regimental Museum at Shirehall in Norwich is moving into Norwich Castle so it can show off its collection to more visitors. The move is also part of a restructure in the Museum Service to save money. Curator Kate Thaxton said: "The great advantage for us is that more people will see it." Shirehall will display the collection until 10 September before the exhibition re-opens in the castle in late October. The Royal Norfolk Regiment was an infantry regiment of the British Army created in 1881. The museum has a varied selection of objects, photographs and archive material connected to the regiment's 300-year history. More than 160,000 people visit Norwich Castle Museum every year. In comparison, Shirehall currently attracts between 30,000 to 32,000 visitors per year. The vacated Shirehall will house the Costume and Textiles Study Centre, which will move from Carrow House, saving The Museum Service more than £100,000. Curators expect a full display in the castle in December 2012.